This high-performance module delivers 20 dB of gain over the broad range of 50 MHz to 1500 MHz with a noise figure of less than 1 dB and an OIP3 of +31 dBm. 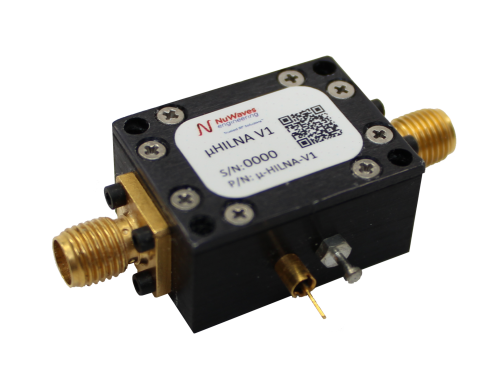 Covering VHF to L-band frequencies, NuWaves’ μHILNA™ boasts the smallest form factor of the HILNA family of low noise amplifiers, designed to achieve high gain while maintaining low noise and a high third-order intercept point. The μHILNA’s miniature form factor of 0.375 cubic inches and weight of 0.5 oz. is ideal for systems that are SWaP constrained. The μHILNA’s robust power supply also operates over a very broad range, easily allowing the unit to be integrated into systems without regard to power supply precision.